Trying something different was fun last month, so this month I thought I'd go really different. Time to make a board game. Lately a local group of friends of mine have started a recurring game night for tabletop gaming, so We've all been playing and thinking about tabletop games a lot more. I've never tried to create a tabletop game. It had never even occurred to me until late February of this year. I happened to read about nontransitive dice not long ago, which seemed like an interesting mechanic for a tabletop game, once you get past the requirement of needing custom dice. The concept began as Manaspring, then Manafont/Manafount, but for various reasons these didn't really work, and finally I landed on Manaspire. I won't go over all the rules in detail here, since the full rules document and all the accompanying files are available. but I'll attempt to hit the highlights and the mechanical hooks of the game. Where the ley lines of mana cross, the fabric of the world wears thin. In time, these confluences can erupt in a torrent of raw power, a manaspire, and ambitious mages will rush to the site in the hopes of attuning themselves to the flood of mana and binding it to their will. Today, you have sensed the formation of a manaspire, but you are not alone. If you wish to claim this power as your own, you will have to prove yourself the superior caster. Send your familiars forth to do battle with any who would oppose you, use the mana of the land to fuel your spells, and race to possess the power of the Manaspire. There are four "forces" of mana in this world, which form a cycle and are associated with colors - Creation (White), Order (Blue), Destruction (Black), and Chaos (Red). Each player is a mage, who controls a small group of familiars. Only the familiars are present on the board - the mages control them from a safe distance. Familiars occupy colored points on the board. On each player's turn, the points occupied determine the mage's mana pool for that round. 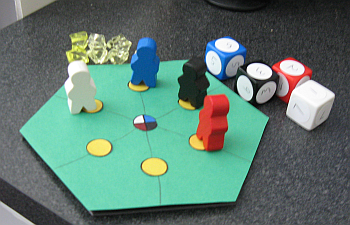 Mana is represented by colored dice, corresponding to the four forces. Other effects as described by spells. Specific points near the center of the board grant attunement to the Manaspire instead of mana when occupied by a familiar. The objective is to accumulate attunement. The first to reach the goal amount of attunement is the winner. The dice setup I used is a varation on Efron's Dice. There are four types of die, one for each color, and in the cycle of White->Blue->Black->Red->White->etc., each die will roll higher than the die after it two out of three times. For the non-adjacent pairs of dice (White/Black, Blue/Red), they're approximately evenly matched - Blue/Red is exactly 50/50, and White/Black is almost the same, with White at a small disadvantage, so White mana was made slightly more valuable in other ways to balance out this slight weakness. Each die has an average value of 5, so overall, rolling a pool of multiple dice will result in the same overall range of results, although the distribution will vary. The idea is that just as there's no color of die that will always win against any other color, there's no pool of dice that will always win against another pool of dice. Individual dice are stronger or weaker against other individual dice, but none should have an objectively higher value than any other. Order isn't much of a die, since it always rolls the same value, but making it a die keeps the game thematically consistent, makes it easier to count up totals when rolling a dice pool, and prevents other players from guessing when you plan to roll Blue in a contest by observing differences in your hand movements. Manaspire uses a flexible board layout for replayability. The board initially consists of a single central hexagonal tile representing the Manaspire and its attunement points. 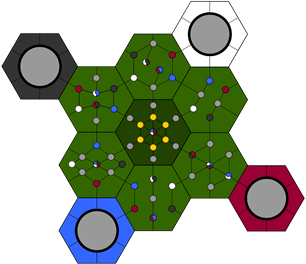 At the start of play, the players add six hex titles in a circle around the core in whatever orientations they choose, then they place their lairs adjacent to the board. The full process is described in the rules. There are also spells which can be cast by players during the game that allow them to remove and replace tiles, or rotate an existing tile. Each hex has a network of internal paths and points. Familiars then begin in the lairs, and can move along the paths indicated on the hexes to occupy points. Points which are colored grant the mage mana on their next turn. When familiars come into contact, they must battle to determine who will possess a point. This is where the nontransitive dice come into play - assuming one player attacks with a familiar and the other player decides to defend, each player selects any one die from their mana pools, then each player rolls. There is no requirement that you allow your opponent to see your choice, and often it's wise to keep this choice hidden. This allows some strategic planning (attacking familiars of a mage whose dice pool is weak against yours) and some player-vs-player interaction (trying to predict an opponent's die choice) while preserving a degree of randomness (even a weak die choice still has a 1/3 chance of winning). Familiars may also occupy attunement points, which grant no mana but instead grant attunement tokens. This is one of the fundamental trade-offs of the game - you can only win by gaining attunement, but the more familiars you send to gain attunement, the smaller your mana pool will be, leaving you less able to defend yourself. Aside from familiar combat, the main purpose of mana is the casting of spells. Each player has a hand of spell cards drawn from a central deck. On their turn, each player gains mana based on the points their familiars occupy. During that turn, they may cast spells found on spell cards. The cost of each spell varies and is indicated on the spell card along with its effects. In order to cast a spell, the spell card must be discarded, along with whatever cost the card indicates, usually one or more mana dice. These dice are removed from the caster's mana pool until their mana pool is reset at the start of their next turn. This is another core mechanic of the game - spells have powerful effects and can be vital for winning, but every spell you cast leaves you less able to defend yourself. Some of the more powerful spells require mages to roll one die from their pool, or even roll their entire pool, to determine what happens to which player. These spells are potentially disasterous for a reckless player who spends their mana and leaves themselves defenseless. So, it's a board game - I needed to put this thing into a physical format for testing. This presented a few challenges that luckily had some quite satisfactory solutions. Dice - This is the big obstacle. In its current design, Manaspire requires nearly 100 d6, divided across four different colors, with custom numbering. After evaluating several options, it turned out the easiest solution was ebay. Several sellers were offering lots of exactly what I needed - blank d6 in the colors I needed, in sets of 25. So then all I needed was stickers so I could number them. 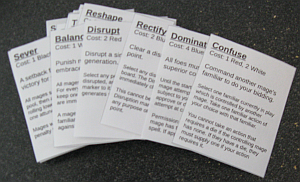 Spell Cards and Player Reference Cards - Cards are the easy part: LibreOffice, tables, cardstock and my laser printer. Board Elements - Same basic idea here as with the cards. Just need some basic skills in the graphics editing package of your choice, a color printer and some scissors. Simple enough. Everything Else - Totally non-paid and honest endorsement incoming. Print and Play Productions was exactly what I needed. They do print-on-demand games and supplies for prototyping and production. I got some large blank chipboard hex tiles for the board, chipboard markers, a bunch of acrylic gems for attunement tokens, a set of color-coded meeples for each player's familiars, and several sheets of 1/2" circle white stickers, exactly the size needed to label 16mm dice, for a total cost of well under $10 (plus shipping). I probably would have gotten my blank dice from them as well if they'd had enough in stock at the time. If I get to the point of creating a final printed version of the game, with a box and pre-printed hex tiles and all that, it's almost a certainty that I'll be using Print and Play Productions. Unfortunately, due to delays getting the prototype game set up and scheduling conflicts, my next gaming group meeting is in early May, so for 1GAM I just have to go with my first version, pre-playtesting, and hope it's at least playable. Assuming playtesting shows promise, I'll likely continue to refine the game and see how polished I can get it. With the custom dice requirements, it's not a particularly good candidate for print and play, but if things go really well I might see about getting a finished game box put together, if for no other reason than to have a game of my own on the board game shelf. All of the rules and printables are included below. Coming up with the markers, tokens, and most importantly, the dice, is up to you for now.